Characterization is sacrificed for plot in Bats in the Belfry. The plot has so many twists that admittedly I gave up trying to decipher the victim much less the murderer by the mid-point. If you wait until the end, the murderer is easily determined by seeing who has not either been killed or at least wounded yet. Written in 1937, the convoluted plot in Bats in the Belfry holds up well for modern audiences. The best part was some of the 30s slang like ker-wite, bally-nix and prosy. I was surprised that most of the words were found by my Kindle simply by clicking on the word so I would recommend reading this book on a Kindle just so you aren’t constantly looking up words on your phone. I was also surprised by the use of nouns for verbs (that practice that drives me crazy now) like corpsed for killed. The reverse was also true. For example, bury-ee is used for corpse. 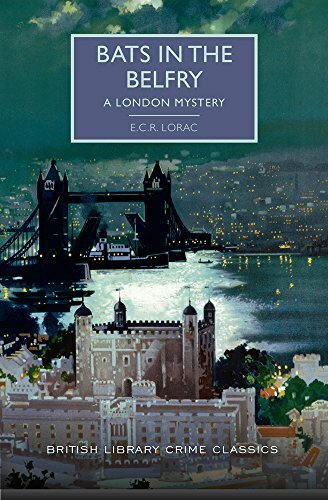 Bats in the Belfry was a good, not great, golden-age British mystery. It is recommended for those readers that look more for plot than characterization in their fiction. 3 stars. Thanks to the publisher, Poisoned Pen Press, and NetGalley for an advanced copy.